WTware on computers with ARM Rockchip processors - Windows Terminal Ware. All links to Rockchip drivers and utilities from this page were found in Internet. We tested them, but we're not their authors so we can't guarantee their safety. Computers on Rockchip RK3066, RK3188 and RK3288 ARM-processors are able to boot only from built-in flash memory, NAND. To run WTware on these computers you'll have to install new image (firmware) to this NAND flash. It's easy. Find in internet the latest released by computer manufacturer firmware for your computer. Not for computer in the same box: manufacturers sometimes put into the same boxes different boards, sometimes incompatible. WTware uses linux kernel and WiFi drivers from firmware, so the newer is firmware, more stable it works. Firmware for some devices you can find on WTware forum, on freaktab.com, the latest images are on chinese file exchange sites like this or this. You can use image with chinese interface, WTware fully replaces Andriod interface. Some computers are able to flash from microSD. Boot SD should be prepared by special utility SD_Firmware_Tool_1.4_with_sdboot_1.17 If your computer can flash from microSD, use it and don't read about flash by USB. Below is how to prepare image with WTware. 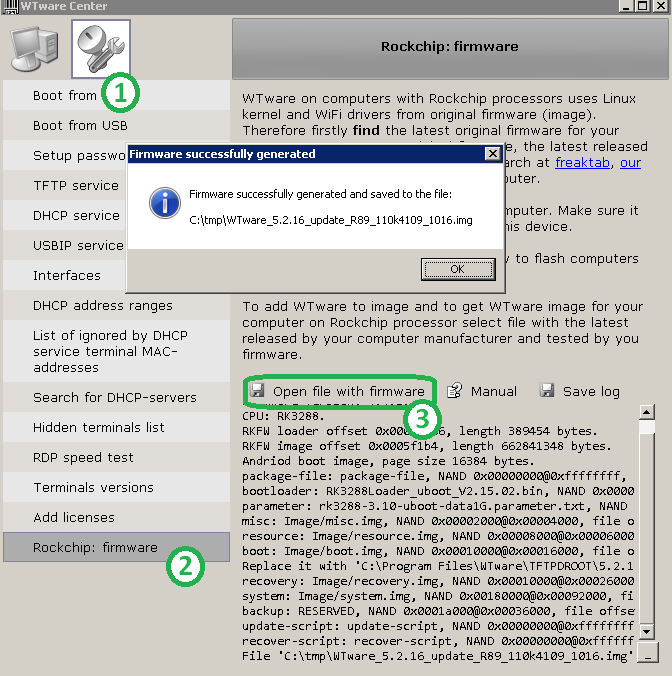 All computers with Rockchip ARM-processors can be flashed by USB from computer. You should install drivers. It's better to perform it on computer with Windows 7, for on some computers with Windows 8 and Windows 8.1 drivers fail to install. You can use installer DriverAssitant_v4.1.1.zip. Easy, convenient, installs lot's of unnecessary stuff. Later you can install only driver for flash manually. Download flash utility. At this moment latest utility is named FactoryTool_v1.35.zip Also in this archive there's 4.1 (06/13/2014) driver, that can be installed manually by Device manager. If computer doesn't work only from USB, attach power cord. Computer shouldn't power on. Press and hold pressed flash button. On CX-818 this button is pressed by clip through microphone hole. On RK-42 flash button is placed to bottom side and can be easily pressed by finger. On some computers button is hidden to AV connector, can be pressed by pin. Google will help you to find where is flash button on your computer. Connect USB cable to OTG connector. Computer should power on, Windows should detect new device. Then release button. If drivers are not installed till this moment, goto Device manager and install driver for unknown USB device. Run FactoryTool.exe, press Firmware button, select firmware file. switch mode to Restore. In list of devices should be device with Device Type: Loader, select it and press Run. When flash ends, computer will reboot. Then it will freeze for several minutes. Then Android interface will start. Make sure, that your computer sees network and WiFi works. Now you can change firmware and replace Android with WTware. Firmware modification is fully automated. Run Configurator, select utility Rockchip: firmware. File with modificated firmware will be created in the same directory as original firmware. Flashing of modificated firmware should be performed the same as with original firmware.